The following offers brief answers to the most frequently asked questions about the Catholic faith. For in-depth answers to your questions about Catholic teaching, visit the Catechism of the Catholic Church. 1. What do Catholics believe? That God created the world and us to live in union with him forever. That union was lost by sin and restored by the death and resurrection of Jesus. The Church was established by Jesus so that we could continue to live in that union by receiving grace. We receive grace in the sacraments as strength so that we can practice charity. All of this together helps us live in unity with each other on earth so that we are ready for eternal unity in heaven. 2. What does the word, “Catholic” mean? Catholic means universal. In other words, Jesus Christ came to save all people not just some and he calls all people to share the life of grace that he offers. The Church is not meant to be an exclusive club but a place of welcome where all can benefit from the life of grace given by Christ through the Holy Spirit. Universal also means the Church exists already on earth and in heaven because we are part of the family of God by baptism and that family includes the saints already in heaven. 3. How do Catholics practice their faith? They practice through sacraments, prayer and virtue. The sacraments include our worship and the way to celebrate God’s gift of grace. Prayer is the conversation with God that should include both speaking and listening so that we better understand God’s will and follow it. Virtue explains what should be the quality of our lives; good actions that reflect our life with God and help bring about greater good in the world around us. Salvation means the forgiveness of sin and being restored in God’s grace, which is given by God alone. All are redeemed by the death and resurrection of Christ but being saved means accepting our place with God as a free gift. Catholics are born again in baptism, but final salvation is judged by Christ only at the time of death. Eternal life with God in heaven is determined at that time according to the justice and mercy of God taking into account the whole of our lives. God exists around us all the time, but there are moments when he intervenes in life to give us grace. These moments are called sacraments, and they dispense the very life of God into the soul. There are seven sacraments in the Church’s life and each gives specific grace to help us live more fully in communion with God. 6. Do Catholics worship Mary and other saints? No, worship is given to God alone. For Catholics worship follows the ancient tradition of offering sacrifice and Catholics never offer sacrifice except to God during the Mass. Prayer and singing and preaching are included in worship but are distinct. So, some people are confused by actions they may judge to be worship but are distinct. Catholics honor Mary and the saints as part of the family of God who are very much alive in heaven and pray for us who remain on earth. They offer hope for having made it to the end of journey. 7. Do Catholics believe the pope is infallible? 8. Why do Catholics confess their sins to a priest? Because Jesus said to. (John 20:23) After the resurrection of Jesus, in his first appearance to the apostles he breathed on them to entrust his Holy Spirit to them, and then sent them out with the power to do what he had done, specifically telling them that their words would have power over sin both on earth and in heaven. 9. What do Catholics believe about holy Communion? In John 6 Jesus said that we were to “eat his flesh and drink his blood.” This caused many disciples to leave him but the Twelve Apostles were among those who remained. At the Last Supper Jesus made clear to them what he meant by taking bread and wine at Passover and saying, “This is my Body. This is my Blood.” He also said, “Do this in remembrance of me.” The Last Supper was the first Mass and holy Communion is the act at Mass of receiving the Body and Blood of Christ that he gave to us. 10. What do Catholics believe about the Bible? That the Bible is a collection of books that contain the truth of God’s revelation. The Bible is God’s living word that has power to reveal God in our history and his voice in our lives now. It is not written as a history book to convey the accuracy of every detail but rather to convey the deeper truth of who God is and why he includes us in his life and creation. It is a gift so that we may know God and follow him. The free and undeserved gift of God’s life and love. It is power given by God so that we may live up to the truth that we profess. It is what enables us to recognize and respond to God at work in our world. Father Erik Pohlmeier is theological consultant for Arkansas Catholic. 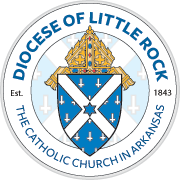 Copyright Diocese of Little Rock. All rights reserved. This article may be copied or redistributed with acknowledgement and permission of the publisher. For more information, Contact Us.